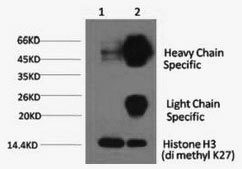 (1) Input: Hela cell lysate (2) IP product: IP at a 1:200 dilution using the Histone H3K27me2 (H3K27 Dimethyl) Monoclonal Antibody. 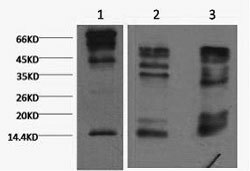 Western blot analysis of Hela at a (1) 1:1000 and (2) 1:3000 dilution. 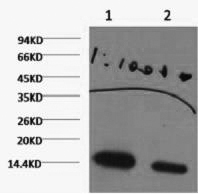 Histone H3K27me2 (H3K27 Dimethyl) Monoclonal Antibody [3B12]. Unconjugated. Raised in: Mouse.